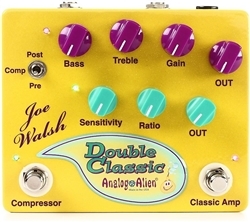 The Analog Alien Joe Walsh Double Classic is a dual effects pedal designed in collaboration with legendary guitarist Joe Walsh (The Eagles, Barnstorm, James Gang, The Party Boys, and Ringo Starr and His All-Starr Band). This is the first official signature pedal by Walsh in his near 50-year career. The Double Classic mimics the authentic Joe Walsh style and sound that has caught much acclaim and herald by rock music giants Led Zeppelin's Jimmy Page, Cream's Eric Clapton, and The Who's Pete Townshend. This unique, one of a kind pedal, combines two essential circuits: Compressor and Classic Amp, which Walsh uses in both live performances and studio recordings.The Compressor on the Joe Walsh Double Classic allows you to control the dynamic range of your instrument. Unlike most stompbox compressors, the compressor in the JWDC has a very natural sound and is musical - much like professional rack mounted compressors found in professional studios. Adjustments can be made with a sensitivity, ratio, and output controls. The Classic Amp was designed to simulate the classic tube amps that Walsh has used over the years. The sound of these vintage amps is legendary and can be heard on countless recordings that Walsh has made throughout his career. The controls on a classic tube amp were designed to be simple and straight-forward and the same is true for the Classic Amp. Adjustments can be made on the bass, treble, gain and output controls.